In November 1983, Duran Duran released their third album, Seven and the Ragged Tiger. In an interview not long after, Simon Le Bon told Rolling Stone that the album “is an adventure story about a little commando team. 'The Seven' is for us — the five band members and the two managers — and 'the Ragged Tiger' is success. Seven people running after success. It's ambition. That's what it's about.” This proves two things: firstly, Simon Le Bon is an utter tool (not that their was much doubt surrounding that one) and secondly, simple bands shouldn’t make themselves appear impressive by having “clever” album titles. It didn’t make Duran Duran look deep and philosophical; instead it was a prime example of trying too hard. Yeah, it probably went something like that. Anyway, despite the eldest brother (Kevin) only being born in 1987, the most striking thing about Lines, Vines and Trying Times is the proliferation of 80s influences. Not 80s in a cool, La Roux, sleek electro revival kind of way, but 80s in a synthetic, cheap, well… Duran Duran kind of way, come to think of it. There are horn stabs at every turn, meaningless phrases, “triumphs” of style over substance and power ballads. The production (and title) of Poison Ivy take it laughably close to hair metal while Hey Baby bounces along on a slap bass figure which reeks so strongly of fromage that even Flea would think twice before donning the Fender and banging his head around in a mindless fashion. As you’d expect, there’s nothing to change the world of popular music in Lines, Vines and Trying Times. There’s the obligatory syrupy ballad or three (one featuring the irritatingly ubiquitous Miley Cyrus) which prove to be the vomit-inducing lightweight pap that the pre-teens seem to lap up, and a couple of songs that seem to have crafted solely with the intention of soundtracking the season finalé of some post-Dawson’s Creek solipsism-fest where Johnny’s upset with Janey and Danny’s angry at Jay but Jay’s in love with Janey and is going through a really, really hard time. Then there’s the singing. Whoever started this style of singing - possibly Mariah Carey - should be made accountable for their crimes as the brothers sing as if (and sorry for descending to this level) they’re attempting to evacuate something particularly obstructive from their bowels. Miley Cyrus is just as bad so the only voice of reason on this album comes from Common. Yep, that Common. Mr Lynn lends his flow to Don’t Charge Me for the Crime; a pitiful attempt at sounding street - careful, they mention the police and pistols - that only succeeds in making the Jonas Brothers seem the kind of people who could have their ice creams stolen by a five-year-old. Now, it’s time for a small confession and one that may be a sackable offence on the good ship No Ripcord (and if that’s the case, thanks for the memories, it’s been a blast, best of luck for the future and all that). In parts, Lines, Vines and Trying Times can be quite listenable. If you manage to ignore the fact that half the tracks make Starship and Heart sound like the Aphex Twin, those Jo Bros sure know how to write a tune. For all the overblown, bombastic production, when they’ve a spring in their step, the melodies are strong and the songs can be fun. World War Three, Much Better and the aforementioned Poison Ivy are catchy enough that if you happen to hear them, you may find yourself inadvertently humming them to yourself hours later. Lines, Vines and Trying Times isn’t a good record and definitely isn’t the kind of thing you should be looking to investigate further. But if you’re reading this review, the chances are it’s not meant for you, so giving it a thumbs-down is hardly earth-shattering news. 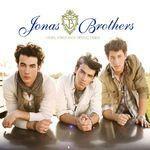 Like it or not, Jonas Brothers and the people behind them know their target market and do what they do pretty well. The abundance of such dated sounds is baffling but consider this: if you had a 10-year-old child who was starting to take an interest in music, would you rather they were into the misogynistic, materialistic world of commercial 21st Century R n’ B or the wholesome, clean-cut image of the Jonas Brothers? While comedian Bill Bailey may have had it right when he claimed there was “more evil in the charts than in an Al-Qaeda suggestion box,” Lines, Vines and Trying Times hardly constitutes the war crime your prejudices may have led you to believe.